Are you ready to experience an unforgettable Italian vacation? This ultimate guide to where to go in Italy will help you plan the trip of a lifetime. During 2017, over 123 million tourists arrived on Italian shores. They came for the food, the history, the fashion, scenic beauty, and fun. These are all aspects that Italy has in abundance, but not necessarily on everyone’s wish list. So, planning your trip is the best way to make the most of your stay in Italy. Read on to find out where to go in Italy for a vacation. You are sure to find a little bit of what you fancy in all the main tourist spots of this gorgeous European country. Read about the best places to visit in Italy, below. Naples is an excellent base for exploring further and has a fabulous history of culinary excellence. All the best Italian eats originated here, like Pizza, spaghetti, and parmigiana. Close by you’ll find famous sites like the Bay of Naples and Pompeii. Apart from excellent opportunities for dining and exploring, you’ll also discover a bustling nightlife and interesting shops to keep you busy during your stay. If you like pretty things, the Lake District is one of the top destinations in Italy for you. Stretching across Northern Italy, this area is a picturesque destination. In the south, flat meadows flow along the landscape while the northern part features tall mountains jutting dramatically from deep, clear lakes. The largest of these watercourses is Garda, while luxurious Como presents stunning forested slopes rising from the water’s edge. Walking and boating are the main activities in this area, but you can also visit ancient monasteries and unique museums. Sicily is the largest island in the Mediterranean Sea and inhabited by a diverse population of Mediterranean folk. A short trip across the Strait of Messina takes you to this exciting destination filled with historic and art sites. From the Valley of the Temples in Agrigento to the heights of Mount Etna, with Palermo’s Baroque churches in between, Sicily is a fascinating place to explore. Famous for being one of the most romantic, must-see places in Italy, Rome will bedazzle you with its ancient charms. From its many fountains to fabulous food and fashion, Rome is awash with attractions and things to do. If you want to learn more about the best places to see in Rome, a guided tour will put you on the right track. This intimate collection of 5 tiny towns on Northwest Ligurian Coast is one of the most popular vacation spots in Italy. A laid-back atmosphere, beautiful hiking trails, fine wines, and first-class olives are all part of the charm here. Cars are few and far between in this UNESCO World Heritage Site which adds much to its charm and relaxed vibe. If you are looking for a retreat after a few busy days of sightseeing, Cinque Terre is just the place. The beaches are small, the townsfolk are friendly, and each village offers its own unique charms. Riomaggiore and Manarola are tiny one-street destinations where you can get away from it all. Manarola has a harbor for swimming and a panoramic view of the other villages, while Vernazza has a historic castle and church. The largest town, Monterosso al Mare, offers a resort feel and is popular with tourists wanting a seaside escape. Overlooking it all from a lofty perch on the cliffs is the tiniest hideaway of all, Corniglia. Finance and fashion are what Milan one of Italy’s leading cities. Prada, Armani, and Versace all call this place home, making it a fashion-forward destination par excellence. There’s plenty to amuse those who come in search of art, culture, and history too. You’ll find Duomo Cathedral, La Scala and Leonardo da Vinci’s The Last Supper among the attractions that draw the crowds to Milan year on year. If it’s wine you want, it’s wine you’ll get if you set your sights on Tuscany for your trip to Italy. The green hills of Chianti are famous for wine tasting tours and incredible bike tracks through the countryside. Historians will adore the medieval villages dotted along the coastline and high in the hills, while Blue Flag beaches are a treat for sun-worshippers. 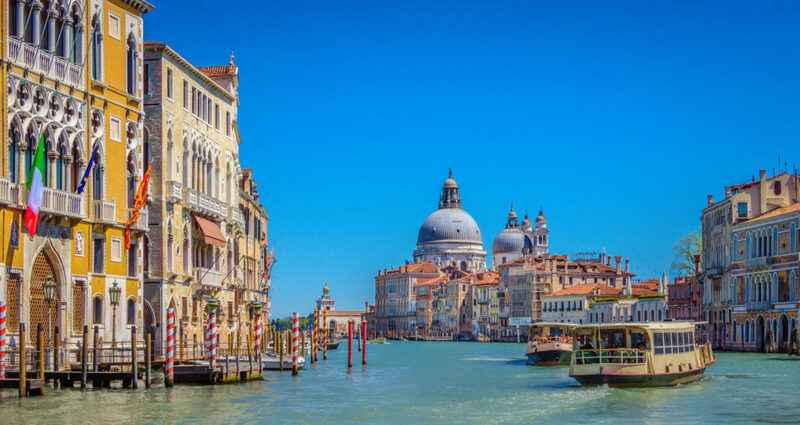 Who can resist Venice with its fascinating mishmash of canals and waterborne lifestyle? Spend your time checking out this romantic city from a gondola or water taxi or take to the few tiny alleys in search of old-world stores and unique architecture. Don’t miss the chance to see St Mark’s Basilica, Doge’s Palace and the Gallerie dell’Accademia while you’re in town. Getting lost is part of the fun during your stay, so don’t bother with a map and let your curiosity guide you. Venice is one of the best places to visit in Italy for Cicchetti – a type of open sandwich which nobody does better than the Venetians. An evening at the opera is another don’t-miss treat during your stay. Each season in Italy brings its own charms to the table. Spring is gorgeously scenic with flowers and greenery everywhere, while fall lends golden-leafed charm to your surroundings. Winter offers opportunities for skiing, and other snowy activities and summer is ideal for a seaside vacation. However, if you’re traveling on a budget, the off-peak seasons of spring and fall are your top choices. Temperatures and prices are moderate, and you’ll find there’s less competition for accommodation. Now that you’ve found out more about where to go in Italy, all that remains is to start planning and get packing! Whether you’re planning a first-class trip or backpacking your way around the world, you’ll find all the inspiration you need on our travel pages. Keep checking back for more useful advice to fuel your wanderlust.